March 2018 - Hairlicious Inc.
"What are your top tips for retaining length on relaxed hair?" See below. Now tell me, what's a hair journey without retaining length? It wouldn't be much of a hair journey if there's no movement in the length of your hair - right? Of course! If you can't hold on to the new length, something is wrong. 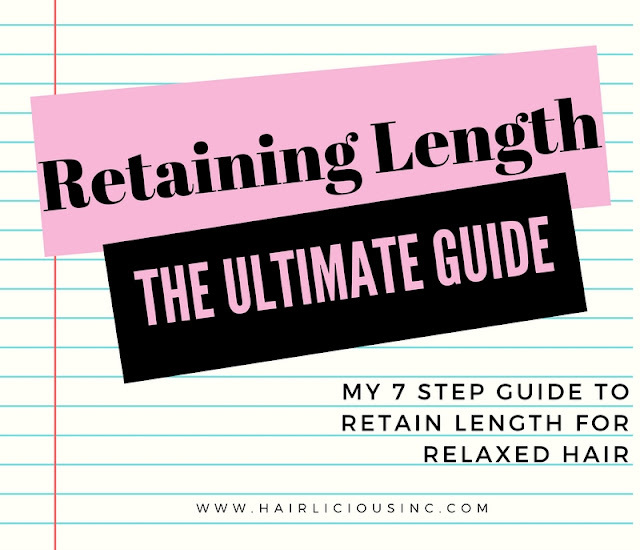 But if your like many, retaining length can be a struggle, rest assured, I will provide you with my "tried and true" gems that have helped me over the years! Step #1 - Moisturize and Seal! One of the most important things you can incorporate into your hair journey is moisturizing and sealing your ends - Period! The ends of your hair are the oldest part of your hair, and not to mention, easily prone to dryness. Hair that is dry and brittle will snap and break off, thus leading to shorter hair. 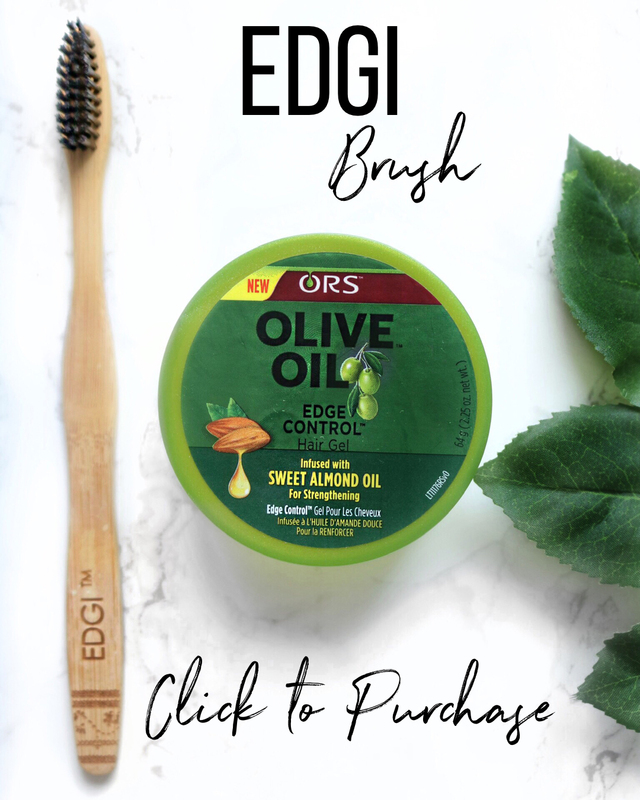 Using a water based moisturizer and sealing with an oil will lock the moisture into the hair increasing elasticity; therefore, preventing dryness and breakage. 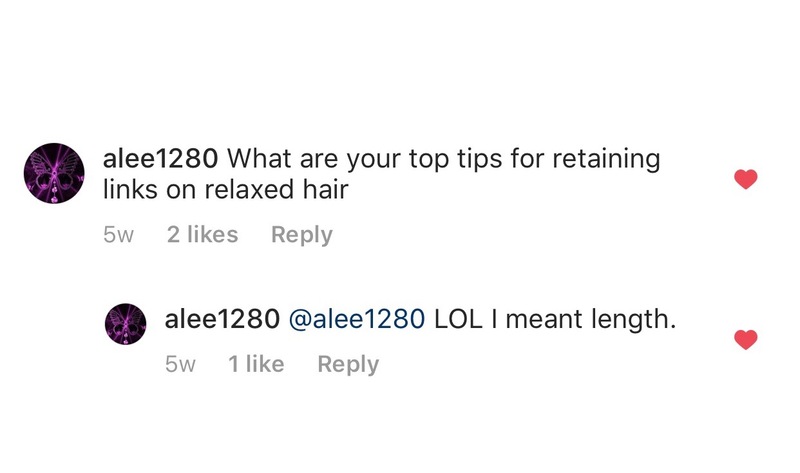 Breakage is the #1 cause for not retaining length; therefore, it's best to prevent it from happening in the first place. My advice is to moisturize your hair anytime it feels dry, rough, brittle etc. Remember, Dryness = breakage = shorter hair. Step #2 - Hide Your Hair! By keeping your ends protected and away from the elements i.e. weather, harsh fabrics etc. your ends can remain healthy and strong. Look to incorporate buns, braids, updo's, weaves, wigs etc. into your regimen, if possible, as a way to preserve your ends. Protecting your ends will not only prevent moisture from escaping the hair but also keep the ends reinforced and preserved by not exposing it to the elements. My advice is to protective style 99% of the time, if you are just starting out your hair journey or have a specific goal that you are trying to attain, in order to retain length. Oh don't forget, always tie your hair at night with a silk or satin scarf and/or bonnet to prevent your hair from drying out! Step #3 - Deep Condition! Deep conditioning with heat is the foundation to any healthy hair journey. Deep conditioning for at least 25-30 minutes with heat (steamer, hooded dryer, heat cap etc.) restores strength and increases elasticity making the hair manageable and fortified to resist damage i.e. breakage. The hair is nourished from the inside out. 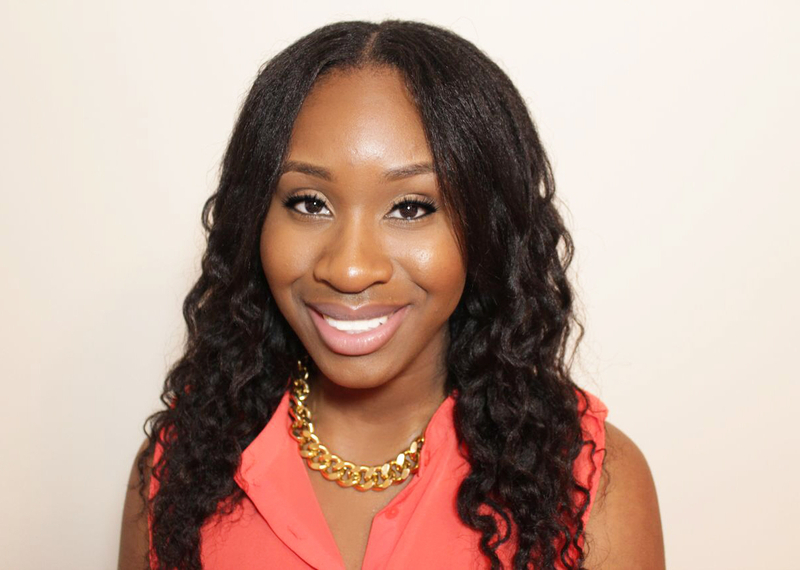 Strong hair = less breakage = increased length retention. Maintaining a proper moisture/protein balance is crucial to achieve strong yet moisturized hair aiding in better length retention. My advice for those looking to increase their length retention quickly, incorporate deep conditioning into your regimen 2x/week with heat for 30 minutes mixed with Avocado oil, Coconut oil and Olive oil (3 Penetrating Oils that fortify the hair preventing damage). You will see a big difference! Step #4 Leave Your Hair Alone! 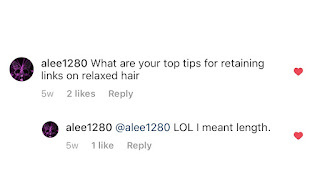 Low manipulation is key in successfully retaining length. Put down the comb, hot comb, flat iron, blow dryer and just let your hair be. No, seriously! The less you do to it, the better. Opt for finger combing, that way you don't loose hair unnecessarily. Incorporate no heat/protective styles into your regimen i.e. buns, braid outs, twist outs, perm rods, weaves, braids etc. to give your hair a b r e a k. If you need to comb your hair, use a wide tooth comb to do so, but finger detangle first! I finger comb my hair daily and detangle on wash days - which is twice a week. Less manipulation i.e combing, styling etc. prevents the loss of protein in the hair and reinforces the integrity of the strands over time resulting in better length retention. Trust me LESS is MORE! Step #5 Listen To Your Hair! I hate to break it to you, but if this skill isn't developed, the success of your hair journey is at risk. Why? Because if you fail to listen to your hair when it reacts to certain products, the health of your hair could suffer causing a setback. My advice to you is if you notice your hair is dry - moisturize it! If you notice your hair is extremely limp - do a protein treatment! If you notice that your hair breaks easily to the touch - do a moisture treatment! Sit back and listen to your hair, it will speak to YOU and guide YOU to longer tresses, just trust the process. Overlapping is a term used to describe when you apply fresh relaxer on top of previously relaxed hair. This is OVERKILL on your relaxed strands – don’t do it! Why? Because your creating a weak point in your strands which will become dull and excessively brittle leading to breakage = shorter hair! It's important to let the new growth grow out to at least 1" before you do a touch up. Relaxing your hair every 4-6 weeks is simply too short of a time frame for enough new growth to appear. My advice is to stretch your relaxers to at least 10-12 weeks (or more) giving you more than enough new growth to work with for a touch up. By doing this, you can clearly see where the line of demarcation is to apply your relaxer. For extra measures, I like to protect my previously relaxed hair with conditioner or a thick oil to prevent possible overlapping. Applying the conditioner to the length of my hair also prevents "relaxer-run-off" (the length of your hair being processed by the relaxer during rinse out) which can lead to thinning and breakage. 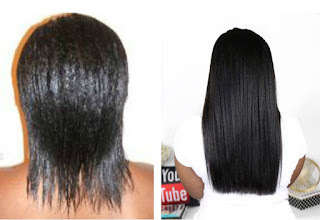 Leaving relaxer on way too long, longer than the recommended time on your relaxer jars, is considered over-processing. Going past the suggested time frame can make your hair overly straight, harm your scalp and make you prone to breakage i.e. shorter hair. Sitting with relaxer on your hair like its conditioner is not the way to go! Over-processed hair tends to be thin and extremely weak (remember your new growth eventually becomes your ends as your hair grows so treat it with care). I apply and smooth my relaxers in 20-25 minutes. I don't sit with it in my hair. As soon as I'm done, I immediately hop in the shower, rinse thoroughly, and proceed to neutralize for 20 minutes. I can always expect straight hair with texture left over. Because there's texture is left over in my hair, my strands are stronger and thicker resulting in better length retention. That's it! I incorporated all steps into my regimen early in my hair journey and they never failed me. I swear by each and every one of the steps listed above as without them my hair wouldn't thrive, be healthy and retain length. I hope this was helpful! Finally it's h e r e!! 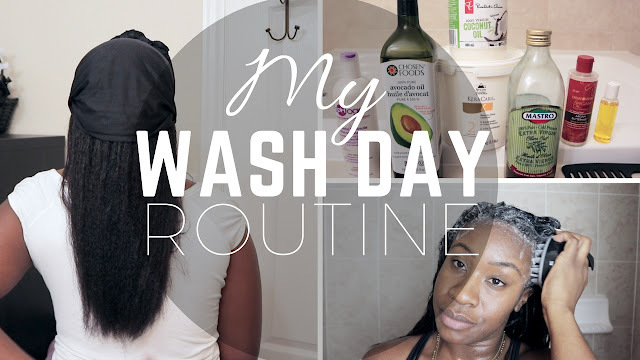 My wash day routine is L I V E on my YouTube Channel! This highly requested video will show my entire step by step process. I did a poll on my Instagram Stories and 92% stated that they would like to see my wash day routine, so here it is. I've been following this wash day process for the past 7-8 years without fail. I complete this process on Sundays (once a week, every week). I always apply my protein treatments on dry hair (for better absorption) with heat, shampoo it out, follow up with a moisturizing deep conditioner (mixed with oils) and then my leave-in conditioner. I do the scarf method - while air drying - until completely dry. Hair steaming has consistently been a part of my regimen since 2011. Steaming utilizes moist heat for better moisture penetration into your hair strands while deep conditioning. If you haven't steamed your hair, you are definitely missing out!! I had quite a few ladies DM me asking me about the brand/model of my steamer. To be honest, there's no particular "brand name", but there is a label on the steamer that reads "KT 3010" (I'm assuming this is the model?!). Anyway, I received my steamer as a gift but I'm certain it can be found online for purchase. As you may/may not know, I have coarse 4b/c chemically relaxed hair therefore it craves hydration! I steam approximately 1x/week and I've noticed H U G E improvements in my hair, over the years, allowing me to achieve and maintain healthy moisturized hair. 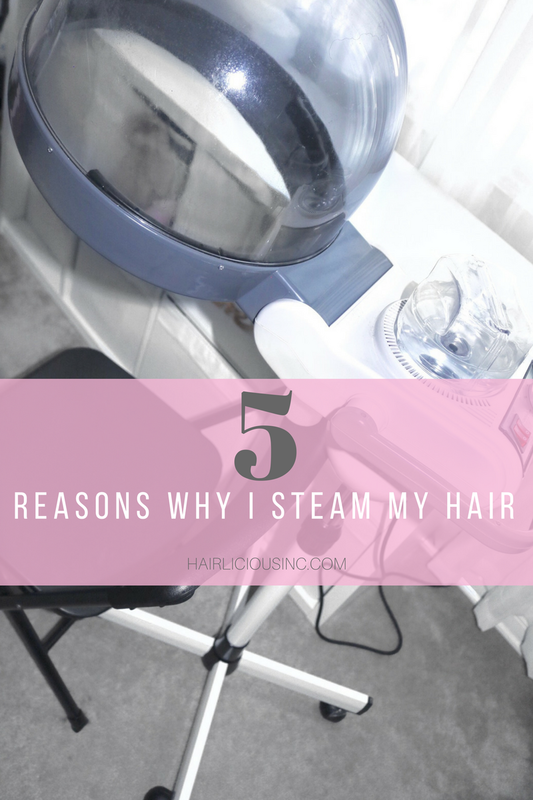 Steaming has been a staple in my hair routine! 1. Moist heat helps to raise the hair cuticles; therefore, allowing the deep conditioner to penetrate efficiently and effectively into the cortex of the hair strands for maximum results. 2. Provides ease in stretching my relaxers as the moist heat softens my new growth melting away dryness, tangles and knots. 3. 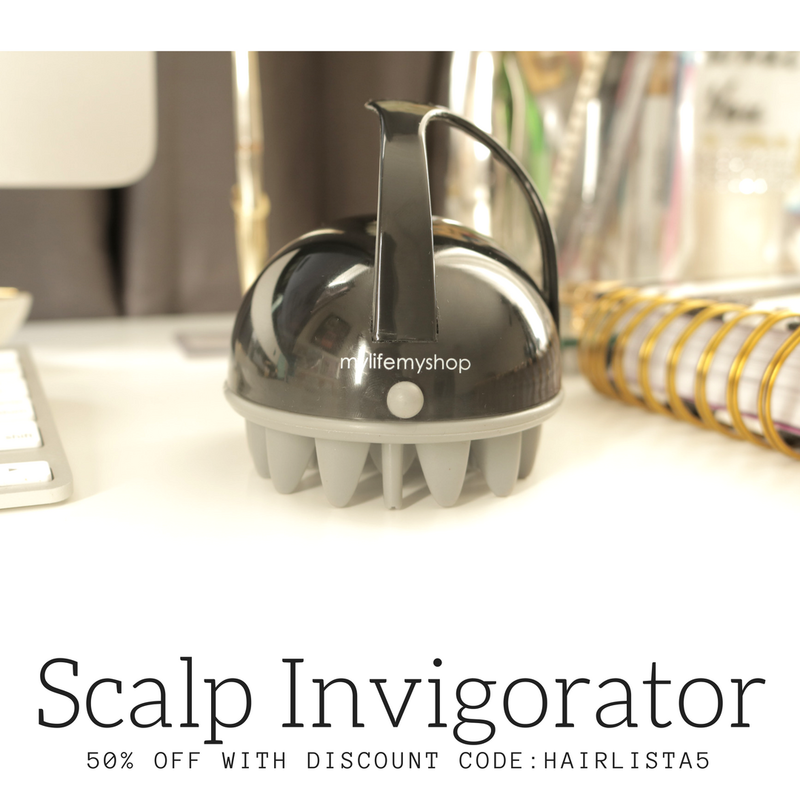 Increases overall moisture and hydration levels in my hair decreasing breakage! My hair is no longer dry and thirsty but healthy and hydrated. 4. Promotes a healthy scalp as the moist heat helps to open up my follicles and clean my scalp of any impurities, product build up etc. which can inhibited healthy hair growth. 5. Increases volume and fullness in my hair! After each use I notice my hair looks thicker and fuller. As the moist heat aids in allowing the deep conditioner to penetrate into the cortex, my strands are hydrated from the inside out. Do you Steam your hair? If so, how often? What steaming tool do you use?